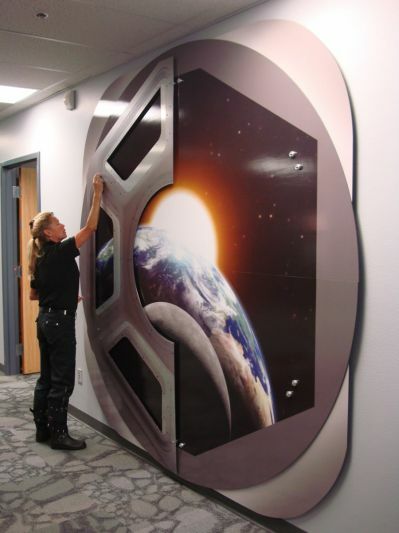 The Space Foundation partnered with Golden, Colo.-based New Vista Image, a division of Lowen Corp., to create graphics for two floors of office space. New Vista Image specializes in large-format digital printing projects, graphic design and graphics installation. 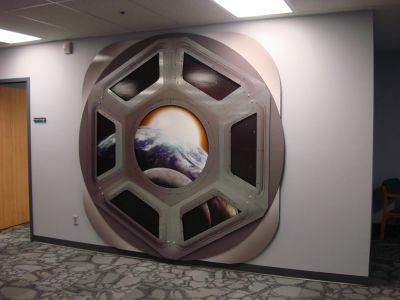 The Space Foundation needed wall graphics for its first-floor lobby area and four large conference rooms as well as for the building’s second-floor Space Foundation team offices. While Reed wanted to create unique multidimensional graphic displays, she also had to stay within a budget set by the nonprofit foundation. So, she turned to New Vista Image for substrate recommendations. As an avid space enthusiast, Ann Brown, president, New Vista Image, was more than happy to provide an affordable multidimensional graphics solution for the Space Foundation. New Vista Image employees printed space images for wall murals on 3M 380cv3 vinyl on a Stylus Pro GS6000 Epson printer and finished with a 3M 8519 luster overlaminate. Brown said the self-adhesive vinyl was specifically chosen because it would adhere well to the building’s walls that featured an orange-peel texture. Routed graphics displayed as dimensional “pop-outs” on the murals were printed on vinyl and laminated onto a number of substrates, including Gatorfoam®, Sintra® and Dibond® graphic display boards as well as onto acrylic panels. 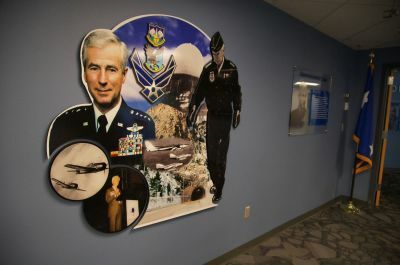 In addition to the wall murals, four first-floor conference rooms were decorated with image collages designed to honor the contributions to space exploration of three U.S. Air Force generals as well as that of a community leader and major space supporter. A background image was printed on vinyl, mounted on acrylic and routed in a disk shape. Additional cut-out images were printed on vinyl and mounted on ½-inch thick white Gatorfoam, then layered atop the background image. Individual substrates were selected for their aesthetics, durability and light weight, according to Brown, who said substrate weight played an important role in the creation of larger multi-dimensional displays. 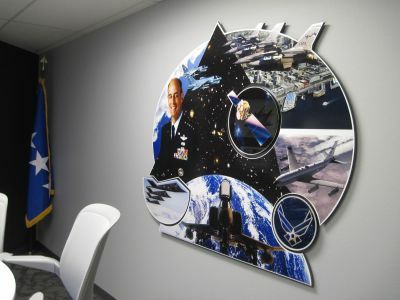 For example, the 10-by-10 foot wall mural installed outside the office of Space Foundation Chief Executive Officer Elliot Pulham features an image of space as it would appear from a space capsule. This vinyl wall mural is framed with two layers of routed 6mm thick black Sintra to give the viewer the impression of looking out of a space capsule window. 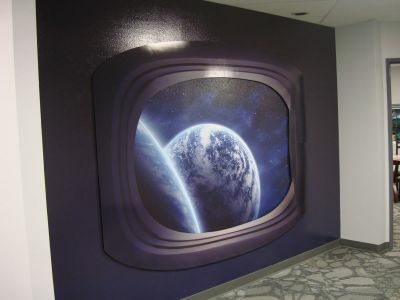 Another 8-by-8 foot vinyl wall mural positioned outside executive offices presents a view of space from a cupola on the International Space Station. New Vista Image framed the mural with two layers of 6mm thick black Sintra – the first layer routed in a square shape with rounded edges and the second layer routed in a circular shape. A final layer – resembling a metal-like space station cupola – was routed from 3mm thick Dibond in the Brushed Silver finish. New Vista Image utilized a total of 328 square feet of 6mm thick black Sintra, 91 square feet of 1/2-inch thick white Gatorfoam and 60 square feet of 3mm thick Dibond in the Brushed Silver finish for the Space Foundation graphics. Reed provided original artwork files generated with Adobe InDesign software to New Vista Image where designers refined the artwork with Adobe Photoshop and Adobe Illustrator software to incorporate bleeds. Graphics production was begun in October 2011 with installation completed in November 2011. The Space Foundation will open the initial phase of its world headquarters’ Visitors Center this October. The Visitors Center will include the Northrop Grumman Science Center, which will feature Science On a Sphere® and be used for formal education, community programs and general public visits. And, the Visitor Center’s El Pomar Space Gallery will display a small portion of the Space Foundation’s extensive collection of space artifacts and memorabilia. The Visitors Center, which is supported by corporate and philanthropic donations, will initially occupy approximately 3,500 square feet. The Space Foundation is raising funds to create at least 12,000 more square feet of displays, including a teaching auditorium and a Space Technology Hall of Fame®. The Visitors Center will be decorated with graphic displays similar to those installed in the Space Foundation’s office area. For more photos of Space Foundation graphic displays, like “Graphic Display” on Facebook at http://on.fb.me/xxbiE3 and visit our “Space Foundation” Photo Album. For more information about the Space Foundation, visit www.spacefoundation.org. Visit New Vista Image at www.newvistaimage.com.